Stalk the rooftops this Halloween when you go in our womens Cat Girl mask! 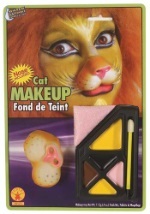 This rubber latex half mask is molded to look like a cat-like creature, with open eyes, nose holes, as well as pointy ears. The back has an elastic band to secure to the face. Drive Batman wild with our unique Cat Girl mask.